Kerala is a God gifted land of copies rainfall. Once the earth is saturated, the overflow runs into canals,lake & streams. This labyrinthine networkof rivers,canals,streams and lagoons constitute the famous backwaters of kerala. A leisurely boat ride along these unique backwater waterways remain one of the most memorable experiences of a traveller. To enjoy this serenity of the enchanting backwater beauty we give most luxury houseboat in Kerala "Royal Suite". Earlier simple facilities are added to the boats used exclusively for travel. Now we add most modern amenities & facility to this boat. When Compare to any other single bed room houseboats in alleppey "Royal Suite" have it on specialities. 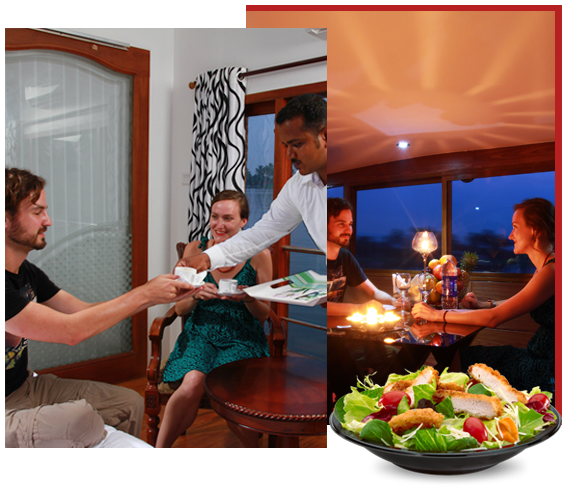 100% Privacy oriented:- The Royal suite is one and only houseboat in alleppey provide 100% privacy. The constraction structures of all houseboats in kerala are the same. Bed Room is opened to the passage area. But in the "Royal Suite" we made change in old stracture & introduce a new idea. In Royal Suite bed rooms are opened to the living area & also fully glassed to get more privacy in bed rooms as wel as living area. 100% insects free:- Main problem in the backwater are insects. In the Royal suite dining area & living area fully glassed & air condition working all the time. So it 100% insects free.